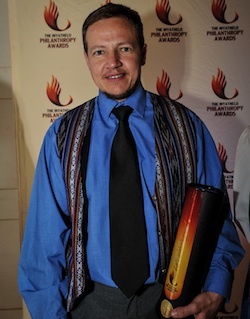 Lex Kirsten received the 2012 Inyathelo Award for Social Justice Philanthropy for promoting the rights of transgender people in South Africa and across the continent. Lex understands the many daily difficulties faced by transgender and intersex people. He was christened a girl but always self-identified as a boy. Ever since he can remember, his deepest wish was to one day wake up in the right body. As a result of his own painful journey, Lex funded the creation of Gender DynamiX (GDX), the first African-based organisation that focuses solely on the transgender community. GDX provides invaluable help, support, advice and information for people who are struggling to cope with their gender incongruence or who are trying to adjust to living in a new gender role. The support provided by Lex, who works as a mechanical engineer at Koeberg Power Station in Cape Town, has enabled GDX to build up a strong network of support in South Africa and serve as a mentor to other transgender-focused organisations on the continent.